Sounds familiar, right? We all experience anxiety from time to time. It keeps us alive, safe from danger. The fight of flight response is a part of every creatures’ existence. For me, Anxiety is more than safety, it’s an illness. The alarm bells that tell you something isn’t right go off without there being any danger. I’m completely safe yet I feel like I am about to die. I was formally diagnosed at 17, but have experienced overwhelming anxiety for as long as I can remember. For so long, I saw this as a bad thing but as I get older, I see the benefits. I’m more aware of myself and my surroundings. I have compassion for others suffering, regardless of what their (situation) may be. I’ve also been able to find things that remind me the feelings of anxiety are temporary. I want to share some of these, so that you too can utilise them. Below are some of my essential anxiety tools. 1. 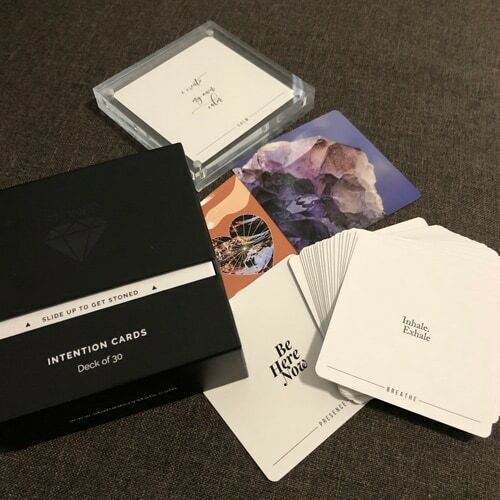 Intention Cards by Stoned Crystals. I was sent these and had planned to use them in a post about setting intentions after the hype of the new years resolution wears off. Instead, I found that the quotes in this deck are a perfect daily reminder that its okay to experience anxiety, and that I can get through an attack and feel better. I keep the cards next to my bed, so I see something positive as soon as I wake up. I’ve been subscribed to this app for a few years now. I use it to help me sleep, for emergency calm during an anxiety attack, or just to relax. 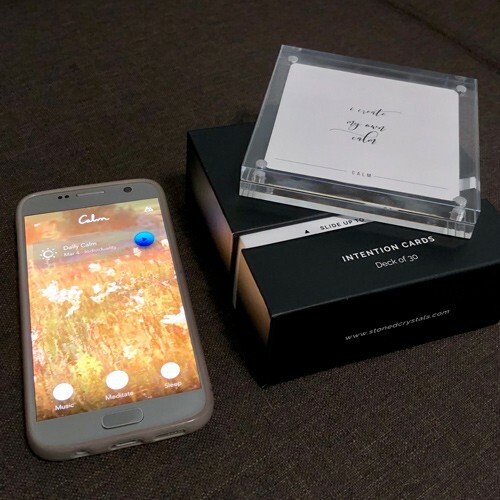 It’s perfect for any time because I always have my phone with me. There is now a music feature which is great when you need a little Zen in your day. This is a huge part of my life. Makeup, music, writing… it’s all a great outlet and the perfect distraction from everything else. Sometimes the worst thing for anxiety is the quiet and boredom. Keeping the mind busy helps to keep the negativity at bay. Of course, these are not my only tools. I have a great doctor, medication to help control the frequency of my anxiety and people around me who help where they can. Anxiety thrives on chaos. Having all of these things in place has really made an impact on my illness. Hopefully, you are able to take something away from this. Regardless of the reason you need it.